"Sunny Boy Storage is affordable and also flexible applicable"
Independent and affordable electricity supply for your home – until now that was not feasible from a technical perspective. But that’s exactly what the new SMA battery inverter Sunny Boy Storage offers. 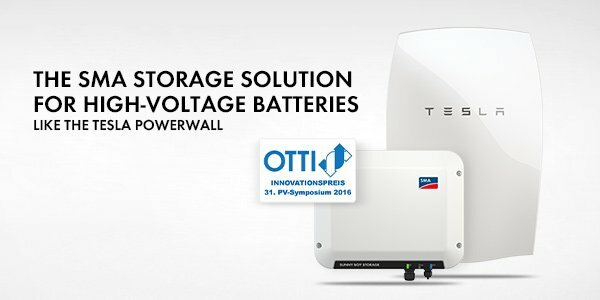 In March, the inverter has been honored with the Innovation Prize at the PV symposium Bad Staffelstein. Volker Wachenfeld, Executive Vice President of the SMA Offgrid & Storage business unit, talks about the post-feed-in tariff era, the differences between storage solutions and how the Tesla Powerwall is going to change the market. What makes the new Sunny Boy Storage battery inverter special? The special thing about the Sunny Boy Storage is its clever combination of different features and technological advances, which are already successfully established on the market. The result is an extremely robust and exceptionally well-designed product at a highly affordable level. We have combined our expertise in the areas of battery inverters and PV string inverters to come up with an AC-coupled system (note: AC — alternating current, DC — direct current) that, from a system perspective, enables optimal coupling of a battery and can also be used extremely flexibly. Whether in new or existing PV systems, we still haven’t come across a situation for which this product isn’t suitable. What is the specific benefit to the end user in using this “AC-coupled package”? Thanks to its AC coupling, customers can install the Sunny Boy Storage anytime and anywhere. The storage system can be integrated into an existing PV system, while the system remains completely intact. An advantage of our solution, particularly in the retrofit market, is that it only needs three components to convert an existing PV system into a storage system. The only other thing needed, in addition to the Sunny Boy Storage and the appropriate battery, is an energy meter. Without the energy meter, the system won’t work, and also competitors need it. Is it really the perfect time for storage systems? Absolutely. Everywhere that incentive programs for photovoltaics are being phased out, sooner or later thoughts are going to turn to using batteries to increase self-consumption levels. The fact is that once all the subsidies are gone, self-consumption is the only sensible use for photovoltaics. This is why we need the battery and, in the best-case scenario, one that can easily be connected to an existing system, no matter what it looks like. Currently, the most affordable solution that can be flexibly retrofitted for the Tesla Powerwall is the Sunny Boy Storage. The Tesla Powerwall is a high-voltage battery. What is the advantage of this technology in comparison to the low-voltage batteries that have been widely used up to now? Volker Wachenfeld at the presentation of the Sunny Boy Storage at the end of January. The high-voltage battery offers significant cost advantages in terms of the battery inverter’s system technology. As the voltage of the battery is already high enough, the inverter doesn’t have to overcome as large of a large voltage jump as it would with a low-voltage battery. This means that savings can be made on a significant component of the battery inverter, the transformer, making the battery inverter itself more affordable. What makes the Tesla Powerwall so striking? It is a key game changer. The Powerwall is the first system that end customers are actively demanding. Why? Because the brilliance exuded by the Tesla car is also reflected in the battery. From the design of the car, the extraordinary sporty driving performance to its exceptional style, is just one reason why Tesla has become one of the top electrical vehicle manufacturers in the world. Another reason is that, thanks to its own battery design, Tesla can offer greater ranges in comparison to other batteries. By creating its own network of charging stations, Tesla has also countered the frequent argument against use of batteries because of the almost non-existent charging infrastructure. In this way, the company ensures that there are no longer disadvantages to the technology, enabling its benefits to shine through. Tesla is a desirable brand. With just the announcement of the Powerwall, Tesla achieved something in an industrial segment that Apple has been successfully pursuing in the consumer sector for years—its customers are eagerly anticipating the new product and actively asking about it. This means a completely new situation for us in the PV storage market. The Powerwall isn’t being sold by the installers, but instead it’s being bought directly by customers. What are the main markets for the Sunny Boy Storage? In Central Europe, our main markets are the countries that already have a significant amount of photovoltaics installed. Naturally, Germany plays a big role in this regard, where the focus is more on new installations. In England, for example, it is entirely a matter of retrofitting. Italy and the Benelux countries are also important markets. Australia is also an exciting prospect as the feed-in tariffs will be coming to an end soon. Overnight, you will then no longer be able to feed into the grid. We are also planning to develop a product that is adapted for the U.S. and Japan. For the U.S. market, we need a product that is designed differently in terms of power because energy consumption there is considerably higher. The Japanese market is currently leaning towards becoming a market driven by self-consumption as opposed to grid feed-in. We naturally want to play a major role here, too. Save solar power with the Sunny Island battery inverter (yellow). SMA offers other storage solutions with the Sunny Island and Sunny Boy Smart Energy. How do they differ from the Sunny Boy Storage? The battery inverter Sunny Island has been developed to provide a safe, clean and reliable energy supply throughout the world. It has a very high functional level, particularly with regard to operation independent of the utility grid, and it can be modularly upgraded—even on a commercial scale. The Sunny Boy Smart Energy is a PV inverter that also has a storage capacity thanks to its integrated battery. It offers a solution to increase self-consumption without requiring the installer to have knowledge of battery technology. There is no need to find a mounting location for the battery, and no battery fuse or DC cabling is needed, as everything is integrated. The Sunny Boy Storage is an AC-coupled battery inverter specifically designed for storage systems in private households. The functions most important for a battery system have been integrated, which makes the inverter extremely cost-effective and flexible. In addition, the integrated, dynamic active power limitation of the PV inverter guarantees customers the highest energy yield possible. Via the visualization in Sunny Portal, it keeps a constant eye on yield and consumption. We offer three different high-performance devices at different prices. This means that we have the right system for every possible application. Volker, thank you for the interview. Questions about Sunny Boy Storage? Then send us an e-mail at socialmedia@sma.de. Our Product Manager Thomas Thierschmidt will answer your most asked questions in a separate blog entry. https://www.sma-sunny.com/wp-content/uploads/2016/04/Header_SBS_02oH_otti_620x300_en_02.jpg 300 600 Anke Baars /wp-content/themes/enfold-child/images/SMA-LOGO-Color_s-1.png Anke Baars2016-04-25 13:24:282017-12-13 16:12:35"Sunny Boy Storage is affordable and also flexible applicable"
we have many customers who want non exporting grid tie and battery back up in case of outage. I like the sma brand, need to see a wiring diagram of the solution with tesla and the solution with SMA batteries. it would be nice to have a one box solution like Schneider XW or others but that might not be possible. I live in TASMANIA, AUSTRALIA and want to install solar PV of 5 kW and a wind turbine generator of 5 kW together with a TESLA POWERWALL. Is there an SMA SUNNY BOY STORAGE suitable for the two inputs from the PV and WIND to manage the charging and use of the POWERWALL for my home which has one 240 volt 50 Hz phase for light and power and another 240 volt 50 Hz phase for our heat pump and hot water system? as the Sunny Boy Storage is AC-coupled you can use both sources, solar and wind. I am currently assisting in the specification of an SMA sunnyboy storage solution with PV in the Algarve, Portugal and have been advised that battery storage, self consumption is not allowed in Portugal. Please advise if this is SMA’s understanding of legislation promulgated in 2015 in Portugal which appears to support battery storage and self consumption. SMA is the only inverter manufacturer with a storage solution approved in Portugal, for now. In the list from DGEG SMA has all the Sunny Island inverters and the SunnyBoy Smart Energy Solution. I currently have solar panels connected to a Sunny Boy 5000 Smart Energy inverter/battery. Will it be possible to add a Tesla Powerwall to this set up using the Sunny Boy Storage?